No event of this magnitude can run smoothly without the hard work and dedication of thousands of people, and luckily NAIG had plenty! Over 2,000 volunteers, including over 100 French-speaking volunteers and 200 medical volunteers, worked together to meet the many varied needs of the Games. Housed at the Orr Centre, volunteers checked into the Volunteer Centre every day to support both their fellow volunteers, and work at venues throughout the city feeding athletes, cleaning up spectator areas, and even putting back together the Cultural Village after a summer storm threatened to tear it down. The volunteers for the 2014 North American Indigenous Games were integral in making the Games an outstanding success. 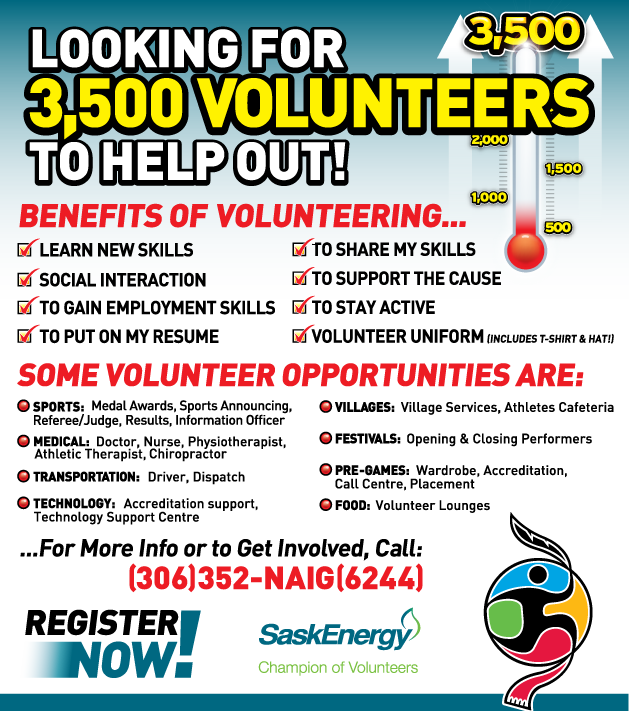 Major partnerships in recruitment of volunteers included SaskEnergy, the Canadian Red Cross, and the Assemblée Communautaire Franksaskoise. Along with the opportunity to see elite athletes in action throughout the week, the NAIG volunteers were rewarded for their hard work with an appreciation BBQ event hosted by SaskEnergy on Sunday, July 27 at the First Nations University of Canada. They were treated to delicious food, great music, meet and greet with members of the Saskatchewan Roughriders, and a special visit from Golden Globe nominated actor Adam Beach, who signed autographs and visited with volunteers throughout the afternoon. Adam also brought along a pop-up movie theatre complete with a 35ft screen, Dolby Digital sound and blockbuster movies, courtesy of his company, Bandwith Distribution, and showed free films for the volunteers.